Nejad, M., Shafaghi, R., Pershin, L., Mostaghimi, J., and Cooper, P. (2017). "Thermal spray coating: A new way of protecting wood," BioRes. 12(1), 143-156. Thermal spray technology was used to apply a thin layer of copper (Cu metal as an antimicrobial coating) on the surfaces of a number of different solid woods and medium-density fiberboard (MDF) wood composites. The adhesion of a Cu coating to Swietenia macrophylla (mahogany), Quercus (oak), Acer saccharinum (silver maple), Picea (spruce), Pinus strobus (white pine), and MDF was evaluated by a pull-off adhesion test. The resistance of Cu-coated samples to mildew, decay fungi, and water uptake was assessed in the lab. Also, the weathering performance of Cu-coated untreated and heat-treated spruce was evaluated. After proper surface preparation, the adhesion of Cu coatings to hardwood and softwood samples was considered very good, and the adhesion of the Cu coating to MDF was much stronger than the internal bond strength of MDF itself. The Cu coating effectively protected the wood from decay fungi and mildew, while it had no effect on the rate of water absorption and desorption from the wood. After one year of natural weathering in Toronto, Canada, the Cu-coated heat-treated spruce samples had significantly fewer checks than coated, untreated wood. 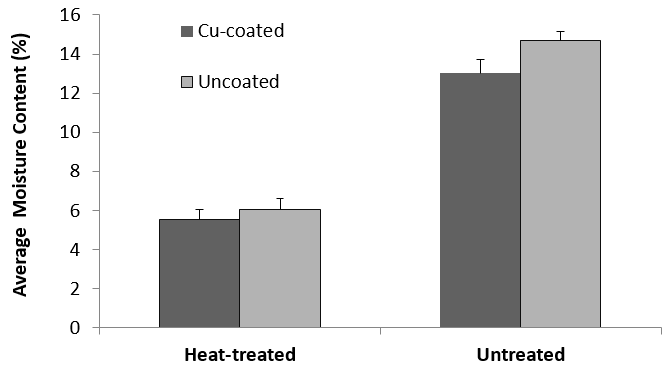 Thermal spray copper coating proved to have the potential to protect wood from biological degradation while also serving as an antimicrobial coating. The durability of any coated product greatly depends on the adhesion of the protective coating layer to the substrate (Weldon 2002). The Centre for Advanced Coating Technologies at the University of Toronto has developed a thermal spray process for the deposition of metal copper on the surface of non-metallic substrates, such as wood and wood composites (Pershin et al. 2015). The Environmental Protection Agency (EPA) considers copper and copper alloys to be antimicrobial surfaces. Copper coating has great potential to enhance the performance of wood products because of its aesthetic characteristics, high thermal and electrical conductivity, high magnetic shielding, and specifically, its antimicrobial properties (Gutierrez et al. 2013). The other advantages of metal coatings in comparison with other organic coatings are that the metal coatings contain zero volatile organic compounds (VOC) and are extremely fast drying (less than one minute). The adhesion of thermal sprayed coating to wood is likely to occur through mechanical interlocking; therefore, it is expected that the adhesion of metal to wood will be greatly influenced by wood’s anatomy, which varies with wood species. Non-durable wood species, such as pine and spruce, are usually treated with a preservative chemical to protect them from decay (Lebow 2010) and insects. For residential applications, most of the treated wood in North America is treated with copper-based preservatives (Freeman and McIntyre 2008). Copper compounds are used as fungicides in these formulations, especially to protect the wood from deterioration in both exterior and in-ground contact applications (Townsend and Solo-Gabriele 2006). However, there are some wood species, such as spruce and Douglas fir, that are refractory and very difficult to treat with preservative chemicals, even under pressure (Lebow 2010). The degree of penetration and fixation of a preservative chemical defines the protection level achieved after treatment. One aspect of the present study is to evaluate the ability of a metal coating to protect wood from decay, which could potentially solve the problem of the treatability of refractory species. Coatings, in addition to making wood more aesthetically appealing, are designed to protect the substrate (wood) from moisture, ultraviolet (UV) radiation, and mildew discoloration (Feist 2006). High-performance coatings formulated for wood should be able to provide good water repellency, but also have good water vapor permeability to allow moisture to escape from the surface of the wood (Feist et al. 1985; Brito et al. 2011). The degree of UV protection that any organic coating provides primarily depends on the amount of pigment added to the formulation (Feist 1983; Ekstedt and Östberg 2001). That is why solid color stains provide better UV protection than transparent stains (Feist 1996). Although metal coatings obscure the beauty of the wood-grain, a thick layer of copper performs similarly to a solid color coating and is expected to protect the surface of wood from UV discoloration. Also, wood coating formulations usually contain a mildewcide, which can reduce the mildew growth on the surface when exposed to high humidity and temperature conditions, such as bathrooms and kitchens. Mildew growth on a coating affects both the appearance and performance by causing premature failure of the coating (Bussjaeger et al. 1999). Mildewcides are usually organic compounds, but zinc oxide is also used as a mildew-static pigment in coating formulations (Ekstedt 2002). In exterior applications, copper is oxidized and forms green copper oxide on the surface of wood. Many people like the appearance of oxidized copper, but depending on the intended application, the rate of oxidation can be effectively minimized by using non-corrosive copper alloys. In this study, we were interested in evaluating the performance of a copper metal coating in exterior applications. However, the main concern was the inflexibility of the copper coating. The dimensional instability of wood affected by moisture absorption and desorption is the main reason for premature failure or peeling of many organic coatings (Ekstedt 2002). For this reason, in addition to evaluating the performance of metal coating on wood, thermally modified wood was also included in the weathering study, as it offers higher dimensional stability than untreated wood (Esteves and Pereira 2009). This study is the first to evaluate the performance of thermal spray metal coating on wood. The specific objectives were to measure the adhesion of the metal coating to various wood species and MDF wood composite and to investigate the performance of coated wood products with respect to decay, mildew, and natural weathering. Flat-grained boards of mahogany, oak, soft maple, white pine, and spruce wood were purchased from Oliver Lumber Company (USA) for this study. Thermally modified spruce samples were prepared by heating wood in a hot-oil bath, as explained in more detail in the natural weathering section. All wood samples were sanded with 60-grit sandpaper and wiped with a damp cloth to clean the dust from the wood surface prior to the copper coating. A twin wire arc spray unit (ValuArc 200) from Oerlikon-Metco (Switzerland) was used to spray a phosphor bronze alloy (94.8% Cu, 5% Sn, and 0.2% phosphorus) at melting temperature of Cu around 1100 °C on the surface of wood samples using air as the atomizing gas. The feed rate of copper alloy was about 80 g/min at a spray distance of 10 cm, a current of 200 A, and a voltage of 33V. After about 5 spraying passes the wood surfaces were completely covered with relatively uniform thin layer of copper coatings. Cross-sections of the coated oak, spruce, and MDF samples (measuring about 6 mm x 6 mm x 4 mm) were embedded in an ultra-low viscosity epoxy resin (Epo-thin 20-8140-128, Buehler, Lake Bluff, IL) and allowed to cure overnight at room temperature. The samples were polished with oil-based diamond pastes (9-µm particle size followed by 1-µm particle size) using a LP-30 polisher (Logitech, Glasgow, Scotland). Back-scattered electron (BSE) images were obtained using a JEOL (Tokyo, Japan) 840 scanning electron microscope (SEM). The images were generated using 15 kV of accelerating voltage and a 1-amp x 10-9 amp current beam, at a 13-mm working distance. The resistance of a Cu-coated sample to mildew growth was assessed based on the American wood preservation association’s standard test method (AWPA E24-06). Three replicate samples of mahogany, oak, soft maple, white pine, and MDF (12 cm x 7 cm x 2 cm) were coated on one side. Then, the coated samples were hung in the conditioning chamber at 32 °C and 95% relative humidity, which was approximately 7 cm above wet unsterile soil inoculated with four mold species: 1) Aureobasidium pullulans, 2) Aspergillus niger v. Tiegh, 3) Penicillium citrinum Thom, and 4) Alternaria tenuissima. 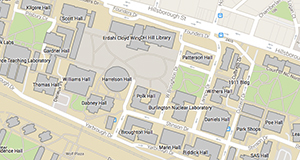 After four months of exposure, the samples were visually assessed for mold growth. Sample rating was performed in accordance with the rating scale described in the AWPA E24-06 standard as follows: 0: No visible growth, 1: Mold covering up to 10% of the surface, 2: Mold growth between 10% to 30%, 3: Mold growth between 30% to 70%, 4: Mold growth more than 70%, and 5: Mold on 100% of the surface. Only white pine samples were used for the decay test. The goal was to test the durability performance of the Cu-coated samples for protection of the end sections of the products with ground contact. The decay test was performed based on the AWPA E10-06 standard by placing two samples, i.e., one coated and one uncoated wood block, in a jar. Postia placenta (PP) fungi were inoculated in potato dextrose agar. Twelve jars were prepared by adding 180 g of soil, 50 g of distilled water, and two pine sapwood feeder strips. The jars were then sterilized at 110 °C for 50 min. A representative sample from each board of the coated and uncoated sapwood of pine wood samples was weighed and placed in an oven at 105 °C overnight, until it reached a constant weight. The moisture contents of the samples were then calculated according to the following Eq 1. Twelve replicate jars were inoculated with fungi and placed in an incubator at 25 °C and 70% relative humidity (RH), for two weeks, before adding the test blocks. Three replicate samples of each board (of the four different types of boards), both the Cu-coated and uncoated wood samples consisting of 19-mm blocks, were prepared, weighed, autoclaved, and placed in soil jars on the infected feeder strips. The jars were placed in an incubator at 20 °C and 65% RH for four months. The mass loss of the samples was calculated after 16 weeks of decay tests, based on the difference between the initial oven-dry weight of the samples (calculated based on representative %MC of samples from the same board) and their dry weight after the decay test. Another set of 20 replicates of the white pine wood samples was prepared (four replicates from five different boards). 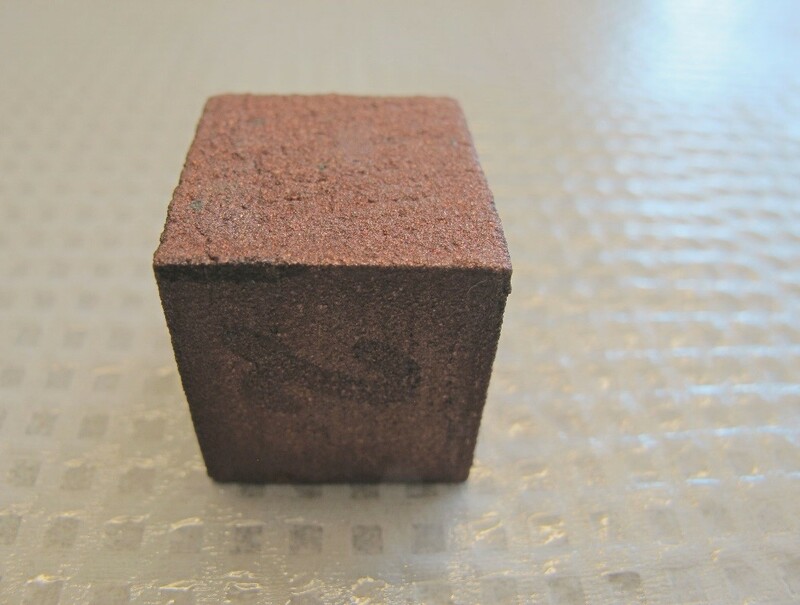 Ten of the samples (19-mm cubes) were weighed before and immediately after the application of the copper coating, which coated all of the sides, to acquire the accurate weight of the copper coating on each sample. Then, two samples of each board, one coated and one uncoated, were used for measuring the initial moisture contents of the wood samples. The other ten replicates’ samples (five coated and five uncoated) were weighed and submerged in 500 mL of distilled water. A glass plate was used to weigh down the samples and ensure that they were completely covered by water the entire time. The samples were weighed after 30 min and every hour after that on the first day, and at the same time every day for the next three days. After 72 h of water immersion, the samples were removed and placed on aluminum foil in the lab for air-drying. Their weights were measured during the drying time, at the same intervals as of the water immersion. The drying data were used as an indication of water vapor permeability of the copper coating in comparison with the uncoated wood samples. Six planed, flat-grain spruce boards measuring 1.5 cm x 8 cm x 240 cm were used for the weathering study. The wood samples were cut in half; one half was oil-heat treated by placing them in a hot-oil bath containing soybean oil, with 10% wax, at a temperature of approximately 80 °C. The temperature of the oil bath was gradually increased until it reached 210 °C and was held at that temperature for three hours. After the completion of the heat-treatment, the samples were removed from the hot-oil bath to avoid oil-uptake by the boards, stored in an oven at 100 °C to be cured, and gradually cooled down over night. Then, two replicate samples (measuring 1.5 cm x 8 cm x 11 cm) from each section of the untreated and heat-treated wood samples were chosen for the weathering test according to modified version of ASTM D1006. Only the top surface of one replicate sample, from each board, was coated with the copper alloy, and the end-grain of the Cu-coated and uncoated, untreated and heat-treated wood samples were sealed with a white-pigmented epoxy coating. 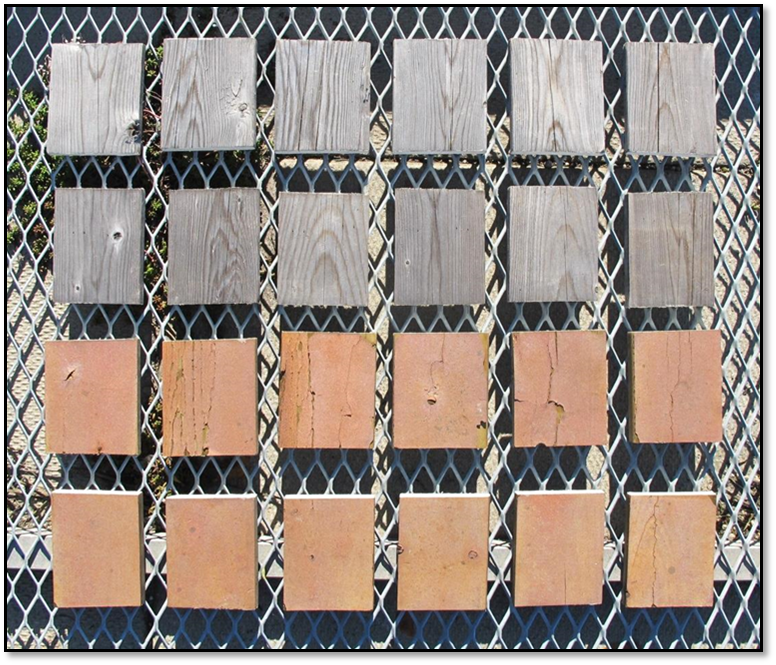 Three small cubic samples were cut from each board (untreated and heat-treated) immediately before the weathering test to determine their moisture contents; the oven-dried weights of the boards selected for natural weathering were estimated based on the MC of the small samples from each board. The natural weathering samples were weighed before the exposure, and then every month for the first three months, and then every three months for the duration of the one-year study, to determine their moisture uptakes. Data were analyzed with two-way analysis of variance (ANOVA) and Tukey grouping using SAS software with 95% confidence interval (α=0.05). The general appearance of coated and uncoated samples were evaluated after one year of natural weathering, and samples were visually ranked according to ASTM D660 for degree of checking in coating and general appearance of wood samples in regards to checking of wood, with 10 as best with no visible checks and zero being worst with many large deep checks that resulted in peeling of the coatings. Also, color change of wood samples were measured using Konica Minolta CM-2002 spectrophotometer in CIE L* a* b* system in SCE (specular component excluded mode) right before weathering and every three months during one year of natural weathering exposure in Toronto, Canada. ∆E color changes of samples were calculated according to the following equation as outlined in ASTM D2244. 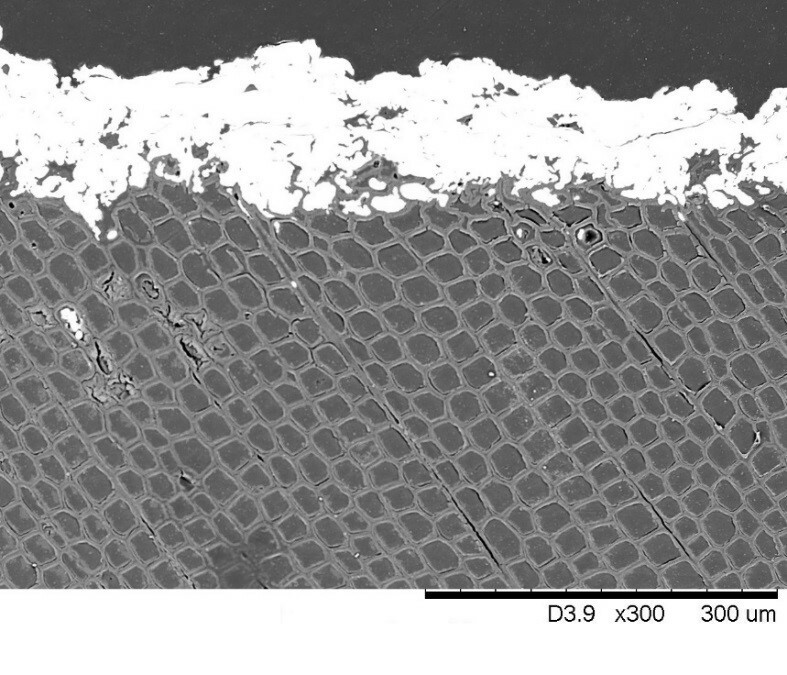 Initially, the copper coating coverage on the planed soft maple sample was patchy (Fig. 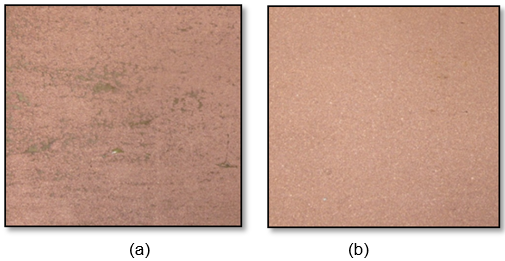 1a), but when the coating was applied after sanding the wood samples with 60-grit sand paper, the surface coverage greatly improved, as shown in Fig. 1b. This could be due to the fact that by sanding the surface of wood with a rough sand paper, more sites were created for mechanical interlocking between the Cu coating and the wood. 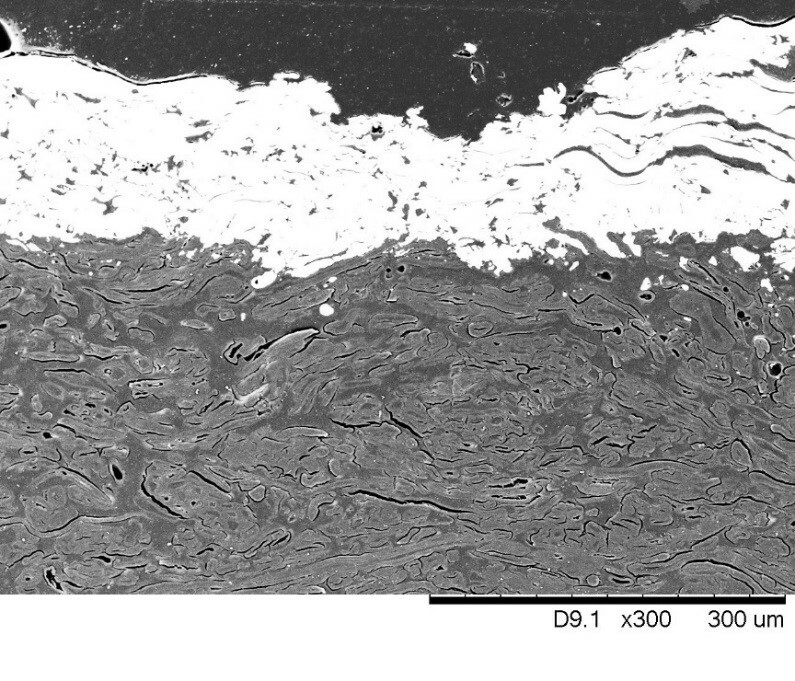 The SEM analyses were performed to determine both the average coating film thickness and also to closely look at the interface of the Cu-coating and the wood samples. 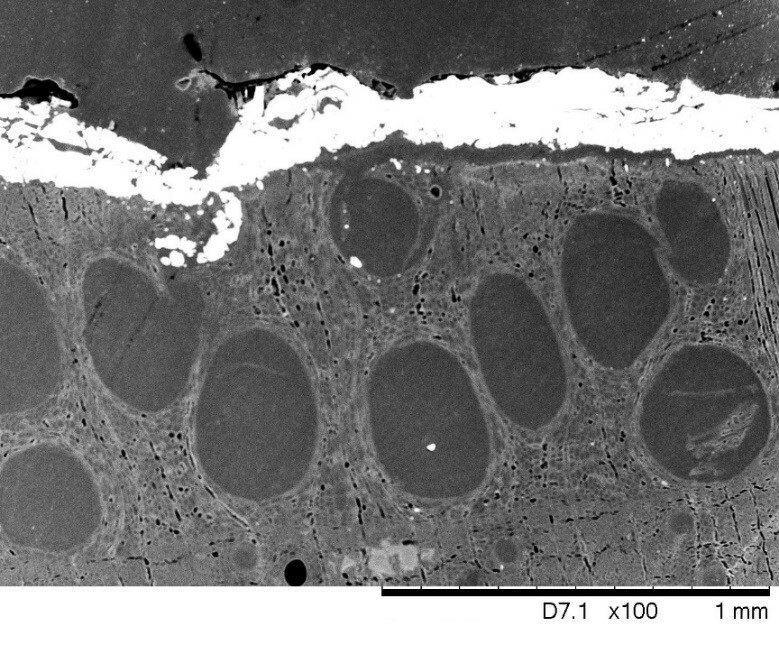 Figure 2 shows the back-scattered electron image of cross-section of Cu-coated oak, spruce, and MDF wood samples. Because copper has a higher atomic mass than the wood component, there were very good contrasts between the coating layers and the wood. As can be seen from Fig. 2, the Cu coating had a porous structure with deep penetrations into the cracks at the wood interfaces, which can explain the better coating coverage after sanding of the wood surfaces with rough sand paper. The average coating film thicknesses were approximately 100 to 150 µm, as indicated by the size of the scale bars in Fig. 2. The results of the adhesion of a copper coating to various wood samples with 8% MC as measured by the pull-off test (average of nine readings on three replicates), are shown in Fig. 3 (on the left axis). There was a significant difference among the different wood species, as indicated by analyzing the data using a two-way analysis of variance (ANOVA). The right vertical axis also shows the tensile strength perpendicular to the grain (shown as red circles in Fig. 3) for similar wood species, which was obtained from a previous publication (Forest Products Laboratory 2010). Overall, the adhesion of the Cu coating to both hardwoods and softwoods wood species was very good; the values were lower than the wood tensile strength for oak, but higher than the wood strength for other samples. Although the adhesion value of the MDF was much lower than that of the solid wood samples, the force that was applied caused cohesive failure of the MDF. Basically, the adhesion was much higher than the cohesion of the MDF layers (or the internal bond strength of MDF), which can be seen in Fig. 4. Table 1 shows a summary of the visual assessment of samples after four months of exposure to mildew. Except for white pine, most other species had very low or no visible problem on the Cu-coated side. Figure 5 shows an MDF sample after 16 weeks of mold exposure. The sample was swollen to almost double its original thickness, with heavy mold growth on the uncoated sides; the copper-coated surface was still free of mold. Images of the Cu-coated and uncoated white pine samples from a similar board after 12 weeks of decay fungi (Postia placenta) exposure are shown in Fig. 6. Comparing the weight loss of oven-dried samples before and after the decay test indicates that the Cu coating was very effective in protecting the wood from decay. The weight losses of the coated samples were 4% ± 3%, much lower than the average (12 replicates of each category of samples) weight loss of the uncoated samples, which was 55% ± 7%. In most cases, the weight losses of Cu-coated samples were zero (8 out of the 12 replicates). The other four samples, which had still lost some weight, were those where some of their corners were not properly coated and the bare wood remained exposed. The Cu-coated white pine wood samples were also tested to determine their water absorption and desorption efficacy. 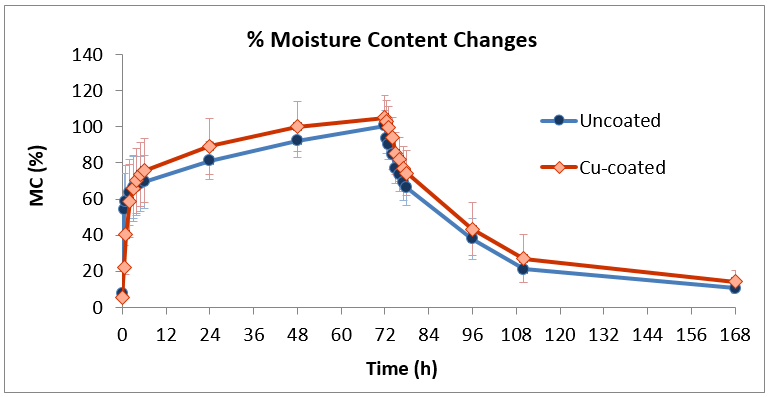 Figure 7 represents the moisture content changes in the coated and uncoated wood samples during six days of water absorption and desorption testing. The results indicate that the Cu coating had no effect on either the water resistance performance of the wood or on the wood water vapor permeability. The drying rates of the Cu-coated samples were very similar to those of the uncoated wood samples. In general, the Cu coating acted as a highly permeable/breathable coating that did not affect the rate of wetting or drying of the pine wood samples. Figure 8 shows the Cu-coated samples immediately after three days of water immersion (left) and the same samples at the end of three days of air drying (right). To our surprise, most of the small cracks had disappeared and there was only one small section that could not recover. 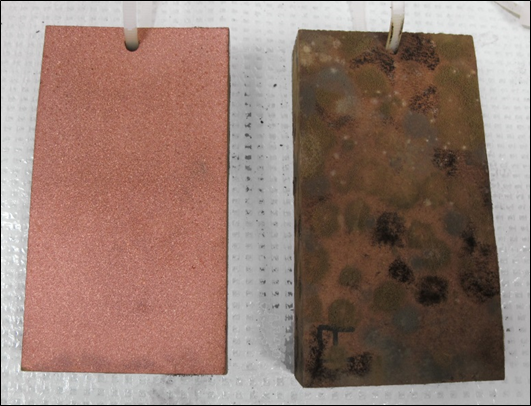 Even though the copper coating was not flexible, the porous structure of coating probably created the opportunity for the coating layer to recover after this wetting (MC of around 100%), and subsequent drying. The general appearance of the Cu-coated heat-treated wood samples (last row in Fig. 9) was much better than that of the Cu-coated untreated woods (third row in Fig. 9). Because the Cu coating was not flexible at all, having a substrate with higher dimensional stability was very helpful. In terms of fungal growth, there was no visible fungal growth on all natural weathering samples: all samples were ranked about 10. Both untreated and heat-treated uncoated wood samples exhibited visible gray discoloration, showing that heat treatment did not have a positive effect on protecting wood surface from UV-discoloration. As can be seen in Fig. 9, there were fewer checks in the Cu-coated heat-treated samples than in the coated untreated ones. For degree of checking of the coating film, only Cu-coated samples were evaluated, and heat-treated coated samples had an average ranking of 9.2 (1.6), while untreated Cu-coated samples ranked 5.7 (2.9). The higher dimensional stability of heat-treated spruce can be explained by its average low moisture uptake throughout the weathering exposure (Fig. 10). The maximum ∆E color change of samples exposed to one year of outdoor exposure is summarized in Table 2. The Cu-coated samples either treated or untreated had on average similar color change as untreated-uncoated wood samples. 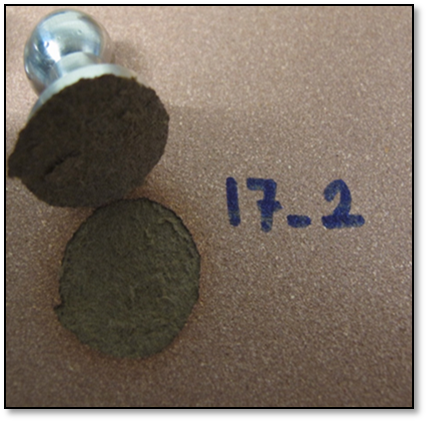 Heat-treated uncoated samples had significantly lower color change than untreated uncoated samples, even though they seem to have similar grey color as untreated samples after weathering. This could be due to initial darker color of heat-treated wood than untreated wood. The analysis of the average percentage of moisture content of these samples with a two-way ANOVA and Tukey test shows not only that the heat-treatment had a significant effect, but also that the coating was effective in reducing the percentage of moisture uptake during the natural weathering (Table 3). The interaction between the Cu coating and the thermal treatment was also found to be statistically significant. The pull-off adhesion test results showed that the metal coating had excellent adhesion to a wide range of wood species and the MDF composite product. Also, a simple surface preparation method (sanding) could greatly improve the metal coating coverage on wood. 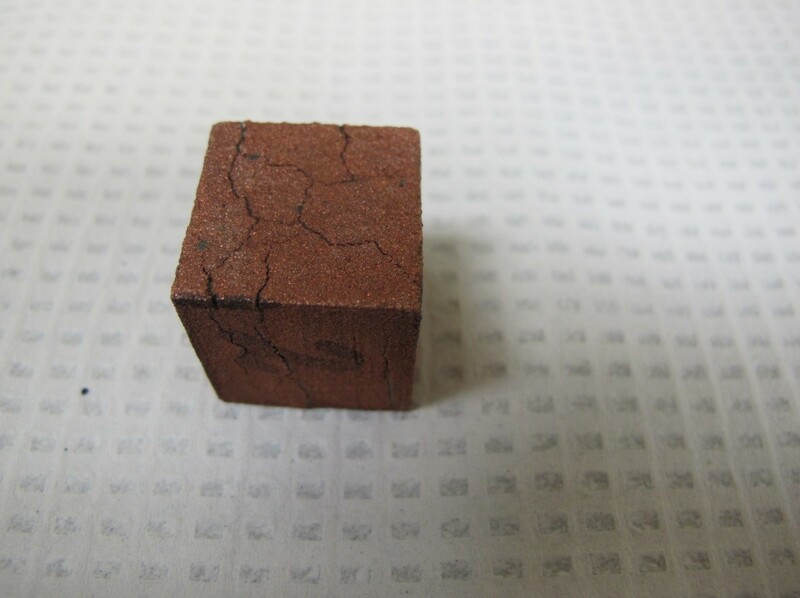 Although the copper coating did not improve the water repellency of wood samples during the water immersion test, its porous structure provided the permeability needed to prevent moisture accumulation inside the wood. For exterior application, only application of a corrosion-resistant copper alloy on heat-treated wood would be recommended for such uses as exterior furniture or to replace metal roofing with heat-treated Cu-coated wood shingles. Results of this study have the potential to open up a new market for wood products (e., arm rests of wooden chairs in hospitals and other public places) by offering an easy solution for coating wood products with an antimicrobial, zero VOC, fast-drying coating, which can also protect the wood from decay fungi and mildew. The authors would like to thank Tony Ung for his help with the mildew and decay test, and the Natural Sciences and Engineering Research Council of Canada for funding support. ASTM D660-93 (1993) “Standard test method for evaluating degree of checking of exterior paints,” ASTM International, West Conshohocken, PA.
ASTM D1006-13 (2013) “Standard practice for conducting exterior exposure tests of paints on wood,” ASTM International, West Conshohocken, PA.
ASTM D2244-16 (2016), “Standard practice for calculation on of color tolerances and color differences from instrumentally measured color coordinates,” ASTM International, West Conshohocken, PA.
AWPA E10-06 (2006). “Standard method of testing wood preservatives by laboratory soil-block cultures,” American Wood-Preservers’ Association, Selma, AL. AWPA E24-06 (2006). “Standard method of evaluating the resistance of wood products surfaces to mold growth,” American Wood-Preservers’ Association, Selma, AL. Ekstedt, J. (2002). Studies on the Barrier Properties of Exterior Wood Coatings, Ph.D. Dissertation, KTH, Stockholm, Sweden. Feist, W. C. (1983). “Weathering and protection of wood,” in: Proceedings- Annual Meeting of the American Wood-Preservers’ Association, Kansas City, MO, USA, pp. 195-205. Feist, W. C. (1996). “Painting and finishing exterior wood,” J. Coating Technol. 68(856), 23-26. Feist, W. C. (2006). “Exterior wood finishes,” in: Coatings Technology Handbook, A. A. Tracton (ed. ), CRC Press, Boca Raton, FL, 111 (1-12). Feist, W. C., Little, J. K., and Wennesheimer, J. M. (1985). The Moisture-Excluding Effectiveness of Finishes on Wood Surfaces, Research Paper FPL 462, U.S. Department of Agriculture, Forest Service, Forest Products Laboratory, Madison, WI. Kretschmann, D. E. (2010). “Mechanical properties of wood,” in: Wood Handbook-Wood as an Engineering Material, General Technical Report FPL-GTR-190, U. S. Department of Agriculture, Forest Service, Forest Products Laboratory, Madison, WI, Chapter 5. Freeman, M. H., and McIntyre, C. R. (2008). “A comprehensive review of copper-based wood preservatives with a focus on new micronized or dispersed copper systems,” Forest Prod. J. 58(11), 6-27. Gutierrez, H., Portman, T., Pershin, V., and Ringuette, M. (2013). “Evaluation of biocidal efficacy of copper alloy coatings in comparison with solid metal surfaces: Generation of organic copper phosphate nanoflowers,” J. Appl. Microbiol. 114(3), 680-687. DOI: 10.1111/jam.12094. Lebow, S. T. (2010). “Wood preservation,” in: Wood Handbook-Wood as an Engineering Material, General Technical Report FPL-GTR-190, U.S. Department of Agriculture, Forest Service, Forest Products Laboratory, Madison, WI, Chapter 15. Townsend, T. G., and Solo-Gabriele, H. (2006). Environmental Impacts of Treated Wood, CRC Press, Boca Raton, FL. Weldon, D. G. (2002). Failure Analysis of Paints and Coatings, John Wiley & Sons, West Sussex, UK. Article submitted: July 20, 2016; Peer review completed: Sept. 11, 2016; Revised version received: October 18, 2016; Accepted: October 31, 2016; Published: November 8, 2016.